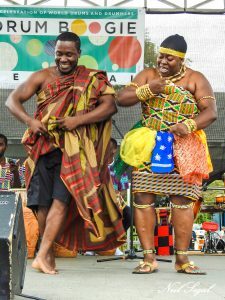 Experience the traditional music and dance of Ghana, West Africa in a free evening event at Mount Vernon City Hall Plaza. The program will showcase the NY Ghanaian Dance & Drumming Unity Ensemble featuring internationally-acclaimed dancers Gloria Nyame and Richard Dwomoh and musicians Nii Boye, Hola Kutte, Attah Poku, Samuel Anyanorh, Michael Ofori, and Ben Paulding. Other performing ensembles include First Ghana SDA Church Choir, Marion Archer’s The Revelators, and Baba Abishai of Obey Foundation. A special guest appearance will be made by Prince Sampson Afriyie Fontomfrom. This program is part of ArtsWestchester’s Folk Arts Program, made possible by the New York State Council on the Arts. Partners include the City of Mount Vernon, the Mount Vernon Boys & Girls Club, the Mount Vernon Public Library, and Bridge to Africa 360˚.